ICPS 2019 will take place at The Palais des Congrès de Paris. 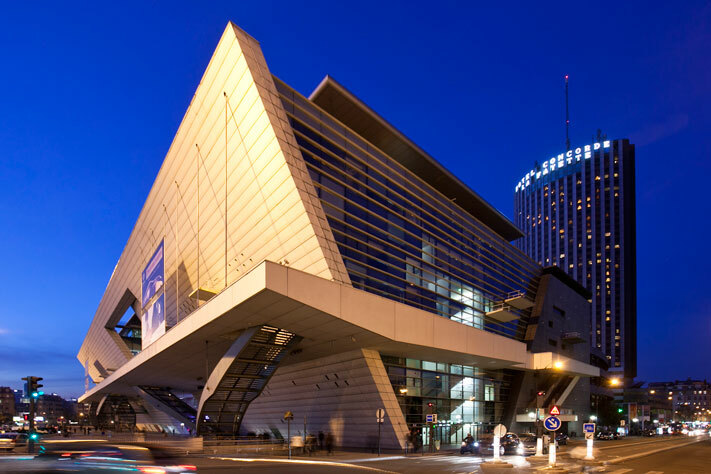 ICPS 2019 will convene at the Palais des Congrès de Paris, an architecturally iconic, easily accessible venue in the heart of Paris. Located in the 17th arrondissement, the Palais offers ICPS attendees a wide range of public transportation options to reach the venue and nearby tourist attractions like the Eiffel Tower and Arc de Triomphe via the Porte Maillot metro station on Line 1. The Palais is a major meeting place for decision makers and scientific experts, and also features a wide choice of restaurants. Visitor information is available through the Paris Convention and Visitors Bureau website and the official travel guide site of France. Paris has two international airports. 18 km (11 miles), south of the city. By les Cars Air France – take Line 1 to get to the station “Invalides” or “Montparnasse” Departure every 30 minutes from 06:00 to 23:00. Approximate travel time: 40 minutes to 1 hour. By Taxi: Approximate travel time to central Paris is 40 minutes to 1 hour, depending on traffic. Paris public transport is operated by the RATP and includes the métro subway system, RER trains, buses, night buses, Montmartre bus, and the Montmartre funicular railway, all of which accepts the same tickets and passes (but see also RER trains below). You can purchase individual tickets, or a Paris Visite Metro Pass, available for 2, 3, or 5 consecutive days and designed expressly for visitors and offering unlimited travel, special offers and discounts of up to 35% at a variety of attractions in the Paris area. This makes travelling around the city very easy. For more information on underground routes and time tables refer to www.ratp.fr. Single tickets are € 1.50. Tickets for public transport are available at subway stations, some bus terminals and registered retailers, usually tobacconists and bookshops, displaying the RATP sign. Although slower than the metro at certain hours of the day depending on traffic density, bus services are frequent during the day and more irregular after 20:00 on some lines. Lines to “Porte Maillot”: 82 (Luxembourg-Neuilly), 73 (Concorde-La Défense), and PC 1, 2 and 3 (beltway line). The average fare from Downtown to the Palais des Congrès is 15 €. For your ride back, there is a Taxi station located in the Avenue de la Grande Armée, right to the Palais des Congrès: +33 (0) 145 72 61 84. Line C of the RER Commuter train provides direct access to “Porte Maillot” station. Shuttle bus service is available from Paris airport Roissy Charles de Gaulle, Paris Orly and the railway stations Gare du Nord, Gare de Lyon, Gare Montparnasse and Gare de l’Est to the Palais des Congrès. Please refer to the shuttle bus link on the Bonjour La France website or the Paris-Charles de Gaulle by public transport webpage.